The cloud truly is the future of business technology. In less than three years, 78% of U.S. small businesses will have fully adopted cloud computing—and law firms across the country have already joined that number. You may already be using cloud technology without even thinking about it. Do you use Google Docs or Dropbox to collaborate on cases? Or an online-based billing and practice management software? These are all cloud technologies that have gained massive popularity in the business world. Security and accessibility are two of the most important aspects of any firm’s IT infrastructure, and the cloud is helping law practices streamline their full IT systems while delivering unmatched benefits that actually improve the way their practice operates. We’ve compiled a list of the seven biggest cloud computing benefits for law firms. If you’re trying to make the case for switching your firm’s network infrastructure to the cloud, here are the facts you need. Hackers are one thing, but you should never underestimate the importance of physically protecting your IT equipment. Cloud computing, especially when you host your data with a Managed Services Provider (MSP), makes it easier for law firms to keep their data safe and secure. Since you’re not housing any equipment on-site at your law office, there’s less risk that something will damage it. MSPs follow strict security guidelines to ensure that your business data is always protected. It’s their job to prevent against breaches—and to respond immediately if something does happen. With remote monitoring capabilities, MSPs can secure your data even when your internal IT team isn’t available. Since many MSPs also have redundant data centers where their clouds are housed, even a physical attack or natural disaster wouldn’t result in a loss of business data. MSPs handle all necessary updates and patches, as well as monitor the IT landscape for widespread threats and vulnerabilities. 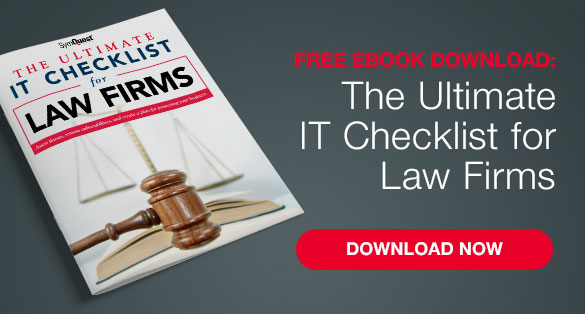 Not only does this ensure that your systems are all up to date, it also contributes to maintaining security—an absolute must for any law firm. The real implication here is that, when you work with an MSP for cloud computing—you get more than simply cloud storage. You get a true partner that adds value to the way your firm’s technology operates, making you more efficient, more productive, and more secure than ever. As a knowledge-based industry, law firms face a major threat in data backup failure. Unless you’re working with an MSP that handles your backup and recovery, there’s a definite possibility that your firm’s data is not being backed up as frequently as it should be. No law firm can afford the loss of business continuity that can result from unexpected downtime. By storing your business data in the cloud, it’s easy to make copies of your data that can be recovered simply, creating a better Recovery Point Objective and Recovery Time Objective. An attorney’s work doesn’t end simply because they’re out of the office. Today’s lawyers need access to their data on-the-go from multiple devices. With cloud computing, your data is available anywhere you have an internet connection—without being chained to a single computer. Many cloud software applications also work independently of a particular operating system, so no matter what system you use, you’ll have access to the files you need. Few businesses are more conscious of adhering to matters of compliance than law firms. A good MSP can contribute to your compliance level if they in turn are compliant with the right standards. For example, the right MSP for your law firm is one that is SOC 2 Type II complaint. The cost of constantly upgrading physical equipment to remain secure and compliant—not to mention adding additional capabilities as your business scales—can be prohibitive. Cloud computing allows your infrastructure to grow along with your practice. No need to add capital expenses to store and cool physical servers. When you need more storage space, you can simply add it without any hassle. This also allows you to budget more effectively as your practice continues to grow. As you take on more clients and add more staff, a cloud-based infrastructure allows you to scale your infrastructure so that you only pay for the capabilities and storage space you really need. If you’re ready to start transitioning your law firm’s IT infrastructure to the cloud, SymQuest is happy to help. Start by requesting a network assessment to get a comprehensive picture of any gaps in your network infrastructure design, along with cost-effective recommendations for how to strengthen and improve your IT. 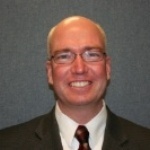 Anderson is an IT Sales Manager for SymQuest, based in South Burlington, VT. Anderson manages a team of Virtual Chief Information Officers (vCIO) dedicated to providing best-in-class IT solutions to businesses throughout Northern New England.